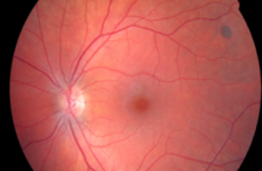 The software is connected to the optical eye fundus image database which allows the doctor to analyse fundus images in interactive semi – automatic way. The software segments images which are of suitable quality, recognizes standard fundus image objects-structures, and calculates their numerical parameters. the software is not linked to diagnostic medical imaging devices and is compatible with all image types, automated image analysis tools, quantitative diagnostic indicators of pathological changes: optical nerve edema, turtuosity of vessels, retina degeneration, diabetic drusen. The software is used in Eye Clinics, Hospital of Lithuanian University of Health Sciences Kaunas Clinics.